Why would someone who thought they will work until they die contribute to a pension plan? Now I'm a UK millennial who wants to retire early, however if I did think I were going to work until I die, why do I have to contribute* to a pension plan at all? The law says a minimum percentage of your ‘qualifying earnings’ must be paid into your workplace pension scheme. Next: even if you think you will work "until you die", you can still access the money saved in the pension scheme when you attain the required minimum age for withdrawals under your scheme. For instance, that may be age 55, but it may also vary by scheme. If you reached the age at which you can start claiming your workplace pension scheme, you don't need to stop work in order to claim. You have a number of options, including taking some of the pension you've built up while continuing to work for the same employer. As to why things are set up this way: While some younger folk may, today, expect to continue working until death, for a variety of reasons that isn't always possible. Two typical such reasons are: disability, and involuntary unemployment (i.e. willing and able but still can't land the next job). Moreover, plans change. Young workers with health and vitality may expect they'll always feel invincible, but end up learning otherwise over time, and may come to appreciate the savings that were forced upon them. The "forced savings" aspect of state and state-sponsored pension schemes are meant to provide some safety net for those later years when it is a strong possibility that one can't continue to work. The alternative is to be a 100% burden on family and/or society. Even if you expect to work you might not be able to due to health reasons or economic factors that make it difficult to obtain employment, so it's good to have a safety-net. A pension scheme, especially if it's tax-advantaged or there's a company-match, can be a useful savings scheme. So even if you're still working when you reach normal retirement age, it provides you with a handy pot of money you can use for travel, recreation, or whatever. As others have mentioned, the pension might benefit other family members such as a spouse or children. You might change your mind about working until you drop. With NHS cuts and austerity you might need the money to supplement whatever care benefits you're entitled to when you do fall ill in your old age. I would look at the wording of the question. "Expect" does not necessarily mean that they plan to work until they die, or that they want to work until they die. "Expect" here likely means that they think they will have to work until they die - in particular, think that they will not be able to save up enough to retire. Thinking that you will have to work until you die doesn't mean you shouldn't save money - that's just giving up if you don't, right? Instead you save up money and hopefully you're one of the luckier ones. The thing you appear to neglect is that: Many people don't have a choice of when they retire. Another issue is that "work 'til I die" people are often 20-50 years old. If they changed their minds or were forced to retire (see above) or came to a realization later in life that they would like to retire, they've missed their chance. They've lost decades of compounding interest because they thought they knew everything in the world when they were 23. Forced retire savings hedges this 'common' mistake. To focus on your test case of Japan. You point out that about a third of them believe they'll work until they die. That means more than a majority of them believe they'll retire. In a democracy where a majority of people make decisions it is completely expected that the majority will dictate the policy. Of course there is fuzziness around that last statement because people who believe they'll retire could very well be of the mindset that they'll handle their retirement savings themselves rather than rely on government. 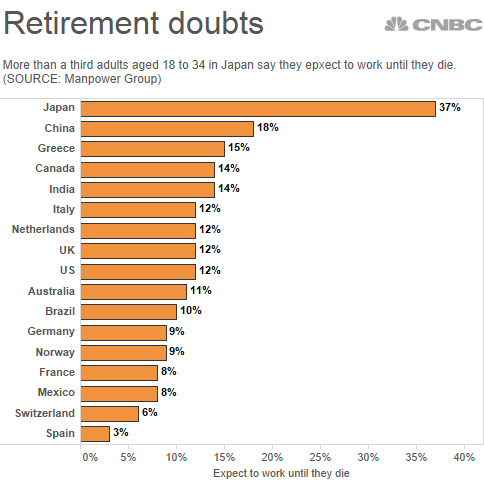 Similarly some people that expect to work until they die might realize that there's a risk that they won't be able to. To focus on the case of government run pensions. The pension program that a government runs isn't like a private savings plan where its purpose is to get you a good rate of return. At best it's an insurance policy; more accurately it's just a tax and you should think of it this way. The reason you should think of it that way is several fold. One, if the pension fund is ever short, the government will make up the difference from the general fund. Two, the government can spend the money from the pension fund on other programs if the law changes which, over the course of a lifetime, is entirely possible. Three, no one has a legal right to withdraw their contributions directly. Four, the point of the program is to take care of old people so they aren't starving in the street. To do this, they take the money of the young and give it to to old people. The money you pay in doesn't go to investments of any sort, it goes directly to the elderly. Ultimately this is why you can't opt-out and why you should think of those contributions as a tax and not as savings. Not the answer you're looking for? Browse other questions tagged united-kingdom contribution pension or ask your own question. Why would a company issue a scrip dividend and how will this issue affect me?